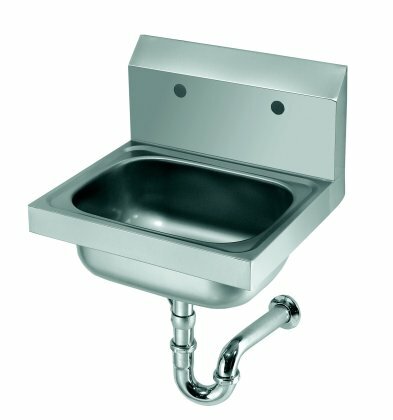 WALL MOUNT HAND SINK WITH P-TRAP, 8" O.C. FAUCET HOLES - NO FAUCET & 3-1/2" DRAIN. Fabrication: One piece 304 series stainless steel. All seams tig welded and polished. Bowl: Deep drawn with stamped rim on 17" models to prevent spillage. Wall Mounting Bracket: Offset design for added strength. Faucet: 4" OC faucet supplied (wall or deck). Drain with Overflow: Stainless Steel with plastic overflow tube and inlet.